Mature new corrosion resistant steels for the manufacture of more environmentally robust, REACH compliant landing gear structural components. Landing gear structural components are currently protected from environmental degradation by the use of chromated, cadmium coatings. The use of these coatings is subject to REACH legislation and a sunset date of September 2017 has been set for chromates, beyond which their use will be strictly regulated. A date of 2019 is expected for cadmium. Frazer-Nash managed the CREST programme for the client through TRL-2 to TRL-5 stages and co-ordinated partner activities to ensure objectives were delivered on time and to high quality. The materials testing programme was large and complex and required expert co-ordination and planning to ensure success. Our knowledge of industrial standards and expertise in statistical methods enabled the computation of material allowables using accepted statistical models appropriate to the population of data. 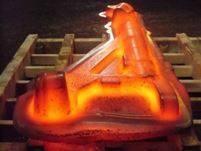 Using our expertise in metallurgy we were able to correlate test results to metallurgical features of the CRES alloy. The analysis formed part of a dossier and presentation which we delivered at the successful TRL-5 review. Our expertise in corrosion and stainless steel microstructure, supported academic research at Swansea University and helped develop a novel corrosion test procedure that replicated the severe in-service environment experienced by landing gear. Continued support for the client towards TRL-6 and certification of the component.